Metal moulders or metal moulding machine setter-operators mould and cast a range of products by mixing materials, assembling mould parts, filling and stacking moulds, etc. Select equipment, e.g. mould boxes, core boxes, cores, patterns, moulding sands, etc., according to the job requirements. Prepare the moulds for metal pouring. Load or stack filled moulds, e.g. in ovens, dryers, curing boxes or on storage racks or carts. Operate heating equipment, e.g. to melt material or to cure, dry or bake filled moulds. Monitor the machinery during its operation. 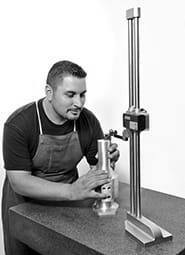 Check the completed work using precision measuring instruments such as micrometers, gauges, etc. Finish the work, e.g. by removing excess material, levelling and smoothing wet mould mixtures. Clean and maintain work area, tools and equipment used in the moulding process. Carry out minor repair tasks and maintenance of moulds and mould parts. Interpret work orders in order to determine which metal parts should be produced.